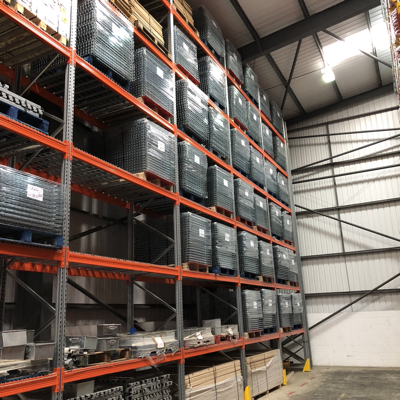 Load notice Archives - Shelving & Racking Ltd.
We have an extensive range of pallet racking accessories in stock, ready for quick dispatch with your pallet racking order or to ensure your existing warehouse racking is safe and secure. Column guards and corner guards are easy to install and help to prevent expensive damage to your racking for forklift collisions. They are compatible with the footplates of all leading industrial racking manufacturers (Apex, Dexion, Redirack, Link 51 etc) and are supplied with fixing bolts. We also have rack end barriers to protect the ends of your runs of warehouse racking. Pallet support bars can be used to avoid the risk of your pallets sagging on the racking, we have standard 900mm and 1100mm depths in stock. If you need more of a shelving level on your warehouse racking, we can supply timber and wire mesh decking. We have a large catalogue of rack identification markers and label holder, with bespoke load notice signs also available within a couple of days of ordering. Whatever you need for your warehouse storage system, we can supply the right solution at a great price. We deliver across the UK every day, so whether you are in Edinburgh, Swansea, Norwich or Brighton we can supply you with the pallet racking accessories you need.